All too soon, the National Democratic Congress (NDC) has elected former President John Dramani Mahama as the party’s Presidential Candidate for the 2020 general elections, after he had walloped six other contestants by a whopping 95% of the votes cast. Being a former president, the delegates must have made the best choice in the sense that Mr. Mahama had contested in two previous presidential elections and was already a household name on the political arena. Again, they must have made a ‘good’ choice considering the fact that the party needed a resourceful candidate to help it execute a fruitful campaign in 2020, and he seems to be the person with that financial capability. 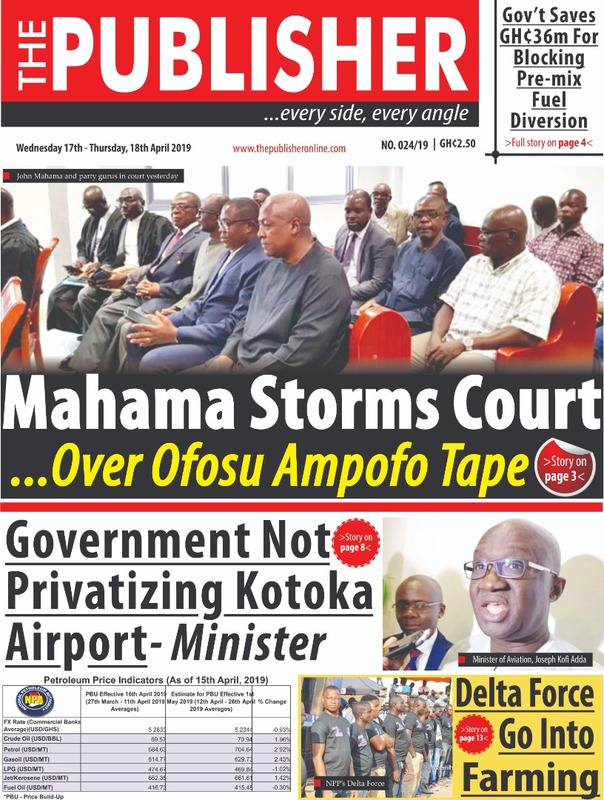 However, one unfortunate thing, in the view of THE PUBLISHER, is that, in considering his positives, the delegates failed to also look at his shortcomings, vis-a-vis the long-term interest of the NDC. All they wanted was to get out of ‘the hellish opposition’ soonest. One cannot deny the fact that the former president, having been rejected after just one term in office, has a huge baggage to clear. From the ‘incompetent one’ tag, to the numerous corruption labels, one does not need to think deep to conclude that the NDC flagbearer has an uphill task, if he is serious of winning the next elections. What is more worrying is his posture on recent events both in his party and the country at large. His ‘boot-for-boot’ comment, after the recent violence at the Ayawaso West Wuogon Constituency by-election, and his claim that the NDC is better in spilling blood than the ruling New Patriotic Party (NPP) is seen as un-presidential; just as his gaffe before the diplomatic community at Peduase is being described as unpatriotic. Regarding the by-election riots, he said inter alia: “We are not going to joke in 2020 and I’m sounding a warning to the NPP – we are going to match them boot for boot. I want to sound a caution that NDC has a revolutionary root and when it comes to unleashing violence no one can beat us to that”. In the eyes of political observers, his loud silence over the shooting to death of NDC Taskforce member, allegedly by another member of The Hawks, a parallel internal militia group, one week after painting the government as bloodthirsty, is hypocritical. He then dabbled in the controversial Ofosu-Ampofo tape in which the NDC national chairman is heard coaching people on how to insult, attack, kidnap and virtually make the country governable ahead of 2020. The former president seemed to justify the tape’s content, to the effect that he alleged the NDC office was bugged by government. In the opinion of THE PUBLISHER, Mr. Mahama’s utterances in recent times clearly portray his failure in communication, contrary to what his fans claim he is – a communication expert. His statements also gave some bravado to Mr. Ampofo, who had for a whole week been shy and timid to respond to the tape. The paper wonders why on earth he could even lie about the tape at no other place than the Perez Chapel, a House of God. While we cannot gag the former president from making public utterances, we can only caution him on his statements before he makes further damage to his credibility and image. He is ‘the party’s best person’, according to the delegates, and he must not disappoint them.